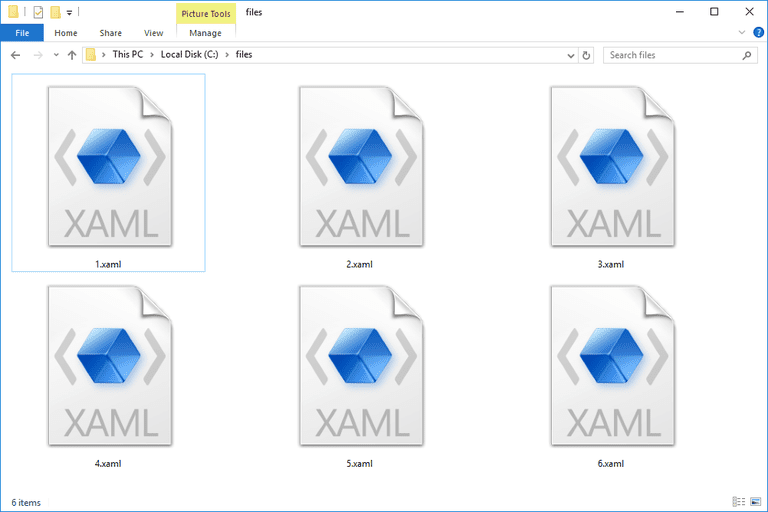 What Is an XAML File? A file with the XAML file extension (pronounced as "zammel") is an Extensible Application Markup Language file, created using Microsoft's markup language that goes by the same name. XAML is an XML-based language, so .XAML files are basically just text files. Similar to how HTML files are used to represent web pages, XAML files describe user interface elements in software applications for Windows Phone apps, Windows Store apps, and more. While XAML content can be expressed in other languages like C#, XAML doesn't need to be compiled since it's based on XML, and so it's easier for developers to work with it. An XAML file may instead use the .XOML file extension. XAML files are used in .NET programming, so they can also be opened with Microsoft's Visual Studio. However, since they're text-based XML files, XAML files can also be opened and edited with Windows Notepad or any other text editor. This also means that any XML editor can open a XAML file, too, Liquid XML Studio being one notable example. Some XAML files may have nothing to do with these programs or with a markup language at all. If none of the software above is working (like if you only see jumbled text in the text editor), try looking through the text to see if there's something useful that could help you find out what format the file is in or what program was used to build that specific XAML file. Some files may have a file extension that looks very similar to .XAML, but that doesn't mean that they're the same type of file or that they can be opened, edited, or converted using the same tools. This is true for files like Microsoft Excel's XLAM and XAIML Chatterbot Database files. Finally, if one program opens XAML files on your computer by default, but you really want a different one doing it, see How to Change File Associations in Windows for help doing that. You can convert XAML to HTML manually by replacing the XML elements with the correct HTML equivalents. This can be done in a text editor. Stack Overflow has a little more information on doing that, which might be helpful. Also, see Microsoft's XAML to HTML Conversion Demo. If you want to convert your XAML file to PDF, see this list of free PDF creators for some programs that let you "print" the XAML file to a file in the PDF format. doPDF is one of many examples. Visual Studio should be able to save a XAML file to lots of other text-based formats. There's also the C3/XAML for HTML5 extension for Visual Studio that can be used to build HTML5 applications using files written in the C Sharp and XAML languages.